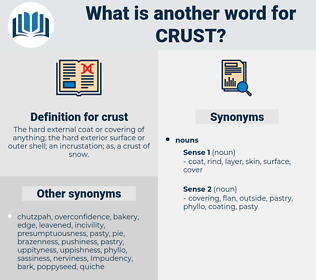 What is another word for crust? The hard external coat or covering of anything; the hard exterior surface or outer shell; an incrustation; as, a crust of snow. interior, center, inside, middle, core. hesitancy, bashfulness, faintheartedness, shyness, diffidence. A horse could hardly get through that crust with safety to his legs. And before school was over Malison's own deed had opened his own eyes, had broken through the crust that lay between him and the vision of his own character. cork jacket, courgette, coruscate, carrycot, cruciate, cricetidae, characidae, corrugated, curst, crested, cryostat, cerussite, correctitude, coraciidae, crazed, Cheshire Cat, crochet, cursed, corixidae, crosscut, church hat, crouched, correct, crocket, croquette, cherished, cross-eyed, crocethia, crossed eye, caraway seed, crocuta, cursed with, carry weight, crockett, czarist, crassitude, cherry-sized, church-state, creosote, crusty, careerist, cracidae, croquet, charge sheet, circuit, corked, corrugate, crosshead, car seat, corkwood, crest, crossed, charged, christie, crazyweed, cracked, charcot, christ, curiosity, coarctate, crazy weed, corset, crocked, crush out, crew cut, cross out, crosstie, crocketed, crushed, characid, corrected, crusted, crusade, crow-sized, crack shot, crooked, cricket, cragged. calculus, tartar, plate, tophus, crustal plate, horst. covering, layer, natural covering, cover.